Streaming video continues to be a hot topic amongst churches, and it’s a topic I get asked about frequently. More and more manufacturers are building turnkey solutions designed to make it easy and we’re back to look at another one. This time, from what is likely the most popular streaming destination for churches, Livestream. Livestream recently released a series of products called Livestream Studio. As of this writing, there are four hardware solutions along with the standalone software. We received the mid-range and highly portable HD500 model for testing, though the software is consistent across the line. The first thing you notice about the HD500 is that it looks like a small desktop PC with a handle on top. It ships with a magical carrying bag from Tom Bihn (seriously, this bag is nice!) What sets the unit apart is that it also has a 17” 1900x1200 LCD screen built into one side, protected by a removable metal cover. Weighing just 15 pounds, it’s easy to carry around, and would certainly qualify as carry-on luggage. Inside the box is a six core Intel Core I7 running at 3.2 GHz. An Nvidia GForce GT520 graphics card drives the built-in display, along with an external one that can be set up as a multi-viewer. There is a 2.5” 500 GB hard drive inside, and with 7 USB 2.0 and 2 USB 3.0 ports, you have plenty of ways to add more storage. Each of the Livestream Studio systems are built around Blackmagic cards; in this case a Decklink Quad and a Decklink Studio. The Quad gives you 4 HD/SD SDI inputs, and the Studio can be configured for input or output for a local live mix. In output mode, one can mix four cameras (along with internal graphics) to both a stream and local video output. The cards support embedded audio on the SDI inputs. The Decklink Studio card will accept analog and AES inputs, or you can use a USB audio interface. The built-in audio mixer in the software allows you to mix sources or have audio follow video. Everything you need fits neatly into the carry bag, making this an ideal solution for portable churches even if they don’t want to stream. The latest software update to the Studio software now allows for recording of up to four video streams at once. You can select from iso camera feeds, and a pre-graphics “clean” or post-graphics “dirty” feed. 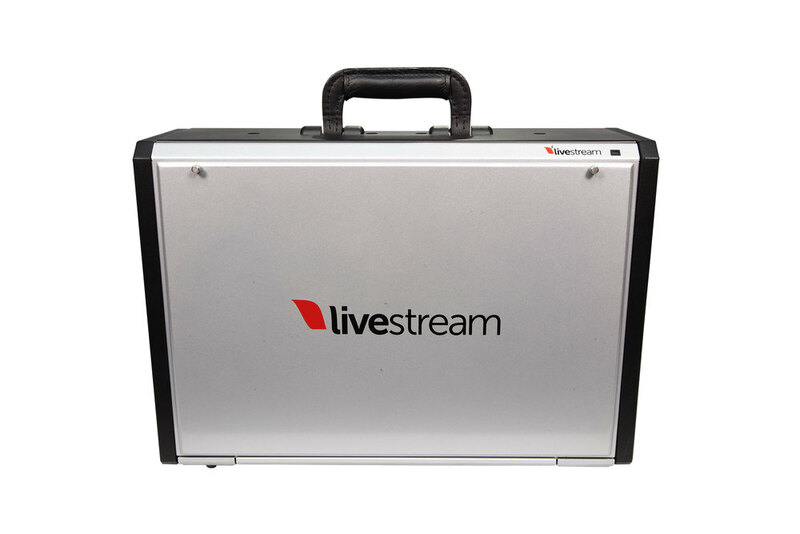 Rather than relying on third-party software control, Livestream built their own. It has a clean, modern interface, and is easy to learn. Whenever I test systems like this, I always try to see how far I can get without looking at a manual. With this system, I had multiple inputs configured, was able to switch both a live feed and get a stream running in about 20 minutes. For the demo, they also included the Livestream Studio Keyboard. It's an Apple Extended keyboard, with custom key silk screened icons for every function. In no time at all, I was switching between our four cameras, adding lower thirds, and sending video to my Livestream account. The built-in screen will display the four camera sources plus preview and program. The source windows are too small for accurate judgments of focus and exposure. But, the system provides both VGA or HDMI port, which allow for a configurable multi-viewer of any size. There are quite a few screen layouts to choose from, and with a simple drag-and-drop interface, you decide what goes in which box. You can even add a clock, a stream window (to verify it’s online) as well as a viewer count. Much to my delight, when I plugged the second display in, it was immediately recognized by the system and the multi-view window appeared. I had fully expected to at least re-start the software, if not the OS. In fact, this rather summarizes my experience with this box; everything works pretty much as you’d expect without a lot of fiddling on your part. You can pretty much plug in and go. Livestream Studio features a two-channel graphic engine with some pretty cool features. It’s easy to build lower thirds and full screen graphics in the editor. Where it gets interesting is the dynamic features. The graphic window offers a design mode, where as you might expect, you layout your graphics, text, logos and other features. Once complete, you enter data mode, which allows you to change the content of the text boxes on the fly with minimal trouble. For example, you could build a lower third graphic with dynamic text. Then, create several possible lines of text for different pastors or speakers. Simply clicking the line makes it active. In just a few minutes, you have a full set of graphics for your staff. And there is only one layout to update with new graphics for each new series. Moreover, the graphics can contain video windows. Thus, you can build complex multi-input picture-in-picture effects that go to air with a single click. What I like about the software is that once everything is set up, it’s easy to operate, and completely visual. While it’s not hard to set up, it would take no time at all to train a volunteer to handle fairly complex graphic overlays. A new feature called Remote Camera allows you to turn a computer desktop (via network) into an input. Studio will accept network camera feeds from a variety of sources. This includes Google Glass, Android and iOS devices, and Windows PCs. This could be handy for including sermon notes on the stream or IMAG screens. Even better, imagine the interactivity you could create for special events. You can also pull in content from your Livestream account as another input source. I didn’t get a chance to test this feature, but it may make it possible to stream from one location to another easily. Quality would be my main concern—but, the quality of the stream I sent from the HD500 was quite good. Each of the four inputs has a scaler available to it, making it easy to mix and match input formats. For my tests, I pulled in a SD SDI feed, a 1080i output from my switcher and another 1080i camera. It converted each source to 1080i as needed without issue, sync'ing everything up in the process. For IMAG systems, everything should be running genlock, and the system allows that. Tally is not supported directly, but a recent software update makes Studio compatible with the tally system made by metaSETZ. Tally is often forgotten with these systems, and I’m glad to see it’s available. While this unit is obviously made to stream to Livestream, it’s also possible to send video to UStream, or YouTube Live. You can also use any RTMP compatible server or CDN, such as Wowza Media Server, Akamai, Flash Media Server. With an MSRP of $8500, the HD500 isn’t inexpensive (though you can find it for considerably less). But, when you consider that you can walk into a venue with a bag on your shoulder and in under 5 minutes be ready to stream, switch and iso record a service, it’s a compelling option. It’s easy to use (I never once consulted a manual or help file to figure anything out), and as far as I could tell, stable. We had no problems streaming a weekend, and the video quality was quite good with minimal latency. The inclusion of the built-in monitor makes it especially appealing for portable churches. Not having to trudge a monitor in and out each week would be a huge benefit of this system. The system comes with a year of phone support a one year warranty and software updates are free. Today's post is brought to you by CCI Solutions. With a reputation for excellence, technical expertise and competitive pricing, CCI Solutions has served churches across the US in their media, equipment, design and installation needs for over 35 years.